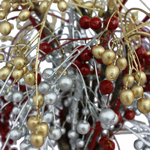 China Berries are available in a fun Holiday Mix at FiftyFlowers.com. These China Berries have been painted with a special floral paint, giving you a festive mix of colors, including Red, Gold and Silver. 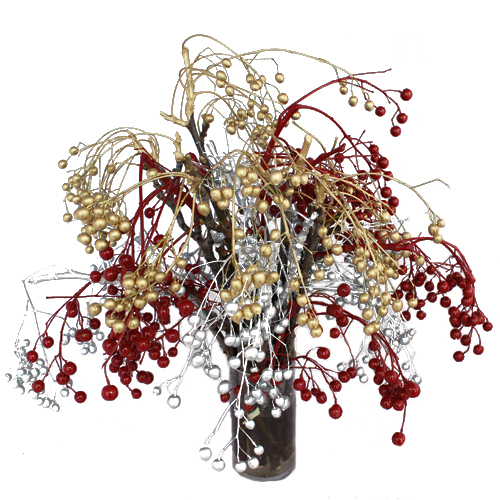 Add these Berries to a Winter Wonderland Bouquet or use them to add a touch of bling to your Holiday decorations. Order Now to receive Free Shipping and Wholesale Prices. China Berries are shipped with 5 stems per bunch. This package includes a mix of Silver, Gold, and Red Tinted China Berries. Tinted China Berries are dipped tinted. The paint may chip off and the natural green color of the berry could be visible. Wear precautionary clothing when processing like gloves and aprons to prevent stained hands and clothing. Due to the nature of the product some laterals or berries will fall off the main stem. This is to be expected. Since Greens are a product of Mother Nature and due to variation in monitor resolutions, the exact color tones of this Green may vary to some degree.